A group of Black Nurses attending the 47th American Nurses’ Association Convention in 1970 held a caucus to discuss common concerns. A steering committee met in 1971 in Cleveland, Ohio and organized to investigate, define, and determine the needs of Black Americans and to implement changes in health care. The National Black Nurses Association (NBNA) was incorporated and obtained tax-exempt status in 1972. A large number of nurses from Washington, DC attended the 2nd NBNA Institute and Conference in Miami, Florida in 1974. The nurses caucused and made plans for a meeting in Washington, DC. The Black Nurses Association of Greater Washington, DC Area (BNAGWDCA) was officially chartered in June 1975. 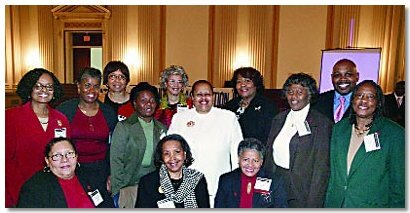 The charter members were Cynthia Barr, President; Claudine Linder, Secretary; Lillian Wade, Treasurer; and Barbara Baskerville, Ada Cain, Janice Crouch, and Bertha Speight, Members-at-Large. Members of the The Washington, D.C., Area Black Nurses Association attended the 17th Annual National Black Nurses Day on Capitol Hill. Seated: Kathy Williams; Patricia Tompkins; Dr. Veronica Clarke-Tasker, professor, Howard University, Division of Nursing and President, Greater Washington, D.C., Area Black Nurses Association. Standing: Dr. Eleanor Walker; Novella Jackson; Margaret Pemberton; Margaret Nelson; Judy Poole; Millicent Gorham, NBNA Executive Director; Velma Henderson, Chief Nursing Officer, Howard University Hospital; Lillian Wade; Eugene Allen; Mary Cromartie. As a local chapter of the National Black Nurses Association, BNA of GWDCA endeavors to support NBNA and provide service to the Greater Washington, DC Area community. Members are encouraged to maintain membership in all professional nursing organizations. Membership is open to all licensed nurses and nursing students. The BNA of GWDCA acts as a vehicle for cohesion and solidarity among Black nurses to insure the continuity of our common heritage. Thus, it was determined that it was important to recognize the contributions of nurses in our community. In celebration of Black History Month, BNA of GWDCA, Inc. hosted its first Annual Salute to a Black Nurse on February 14, 1981 at St. Elizabeth Hospital. “The Salute” has become one of our signature community programs, expanding to encompass the provision of continuing education for nurses, as well as the recognition of our scholarship recipients. Scholarships are awarded to college bound high school seniors entering nursing programs, matriculating nursing students and licensed nurses seeking additional nursing education. BNA of GWDCA has a distinguished legacy of community service. Past programs which support our objective of addressing specific health problems of the Black consumer and health care disparities have included participation in the National Black Nurses National Hypertension Project, National Depression Project; partnerships with the American Heart Association and the American Cancer Society. Our signature community service project continues to provide community based health assessments and teaching through church based and collaborative health fairs, and partnerships with the DC Department of Health, Office of Immunizations and the Washington Hospital Center. In response to the critical shortage of nurses in all areas of practice, the BNA of GWDCA “Choose Nursing Project” involves providing career information, mentoring and role modeling for targeted students in DC area middle and high schools. As a chapter, our challenge is “Empowering the Community through Education, Service and Caring”.